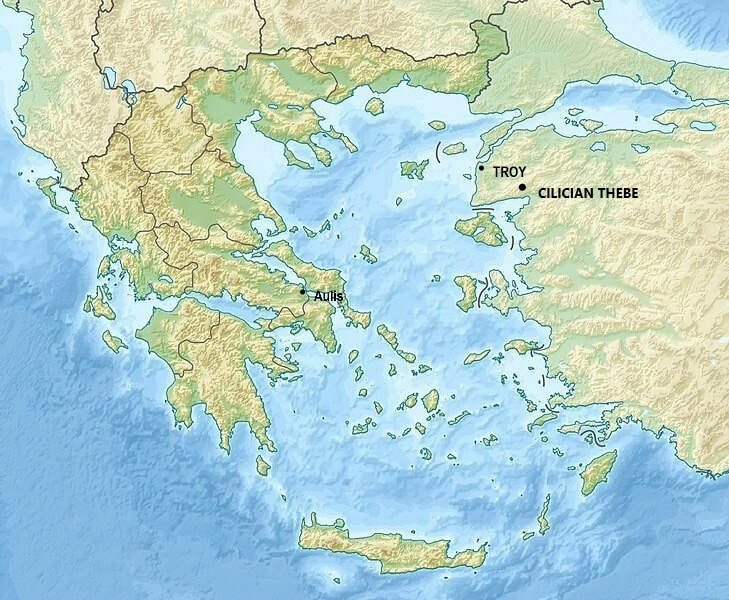 The city of Thebes was a prominent city state of ancient Greece, but the city of Thebes in Boeotia was just one city named Thebes, or Thebe, in Greek mythology, for in the Iliad, a second city was named Thebe, this one being in Asia Minor. This second Thebe was named Cilician Thebe, or Thebe Hypoplakia, to distinguish it from the famous city of Cadmus in Boeotia, or even the Egyptian city of Thebes. Confusingly though, Cilician Thebe was not found in the classical region of Cilicia Asia Minor, but was actually a city of the Troad. ​Like the Boeotian Thebes, there is a founding myth linked to a great Greek hero, but in the case of Cilician Thebe, it was not Cadmus who founded the city, but its founding father was in fact the greatest of all Greek heroes, Heracles. Heracles travelled through the Troad on several occasions, but his most famous visit occurred when he sacked the city of Troy. King Laomedon of Troy had refused to pay Heracles when Hermione had been rescued from the sea monster, and so Heracles took Troy, and killed Laomedon in the the process. Heracles then built a new city, and named it Thebe in honour of the city of his own birth, Thebes. Cilician Thebe was not in the region now known as Cilicia, but was on the border of the Troad. The location of this new city was to the west of Mount Ida, specifically at the foot of Mount Placus, one of the smaller peaks of the Mount Ida range; hence another alternate name Hypoplacian Thebe. Despite the founding myth, Cilician Thebe comes to the fore during the Trojan war, when the city was occupied by people called Cilicians, a populous ruled by King Eetion. Cilician Thebe was the home of King Eetion's daughter, Andromache, before her marriage to Hector, but this marriage also saw the city a target for the Achaean forces during the Trojan War, for Eetion was perceived to be an ally of King Priam of Troy. Thus, in the tenth year of the Trojan War, Achilles led an Achaean army against the city, and despite a defence led by Eetion and his sons, Cilician Thebe would fall to Achilles. One notable prize taken from the city was the beautiful Chryseis, who would become a prize of Agamemnon. Some have suggested that after the fall of Cilician Thebe, and the death of King Eetion, the remaining population of the city, deserted the city and travelled further south, and gave their name to a new region, Cilicia.